Seventeen years ago an entire generation of aliens were sent to Earth in order to save their home planet and integrate into the human population. Now, those aliens are being hunted. Amery Jones is your typical teenager, except for the fact she is an alien and a member of the government’s secret Project Integrate. When Amery’s best friend Lola is kidnapped in order to get to her, there is only one person that can help, the exceedingly annoying and charming Lochie Mercury. Together, Amery and Lochie must put aside their differences and attraction in order to rescue Lola before it’s too late. It's a twenty five year program, where a group of children from the planet of Trucon were chosen to save their species, blend into society as upstanding citizens before being revealed as aliens who are seeking refuge. Amery isn't your average seventeen year old girl, she's part of the program. She lives each day with a false smile and kindness as per the department rules. Her foster parents who work for the FBI have instilled in her that she mustn't cause conflict, so Amery is expected to be popular, likable and the perfect teen. If only Lochie didn't annoy her so much. Lockie is popular, athletic and intelligent, and Amery has carried a grudge so long, she barely remembers why she dislikes him so much. Best friend Lola has a theory, but Amery laughs off the suggestion that what she feels for Lockie is any more than distaste. But not only are the two thrown together to complete an assignment for their English class, but when three men in dark suits begin watching Amery's every move, Lockie becomes involved in the fight for Amery's survival and unaware to the danger they both face. They call themselves The Originals, a self imposed group of humans who believe they are entrusted with saving humanity. Their mission is to capture and dispose of the children of Trucon, in a desperate attempt to keep humanity pure. But when The Originals capture Lola, Amery is willing to exchange her life for that of her friend, even if it means never being able to explore her feelings for the boy that no longer annoys her. 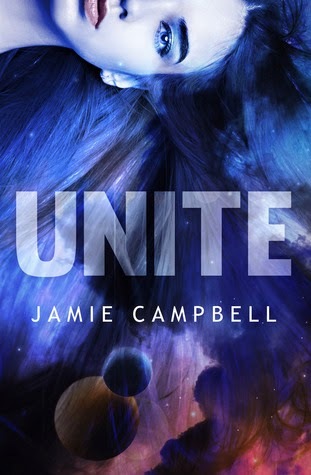 I enjoyed the premise of Unite, it reminded me of Jennifer L. Armentrout's Lux series, but for the younger audience. The planet of Trucon is expected to be wiped from the solar system by a meteor and Earth is the only planet where inhabitants can migrate to. The government have allowed the children to enter a twenty five year trial, in which humans will be told about the aliens that walk among us on completion. But The Originals are determined to end their existence, they'll stop at nothing to remove each teen to keep the human genes pure. I love to support Australian authors, and Jamie Campbell has created a fun and adventurous young teen series. Older or mature young adult readers may find the cliched love interest and instant love tedious, but for the intended teen audience it's age appropriate. I would have liked to have read more about The Originals, the group destroying the teen aliens, but being somewhat of a secret organisation, we only experience the storyline through Amery's point of view. It was entertaining and I loved the quirky descriptions that only Australian's would probably pick up on, spelling and phrasing that is uniquely home grown. It was cute, predictable and offers a sense of fun. I'm all for Aussie authors as well, but this book just sounds so cliche! I really dislike blurbs that basically pave out the way for an insta-love, it just seems to lose a lot of the excitement. However, I am so excited that YA is starting to delve into the sci-fi genre! Great review! Sounds adorable, I love books about Aussie Authors it is the best! But yes the Lux series does get very saucy so glad there's a more PG rated one lol.